Maria Valdovinos, professor of psychology, has been invited to present at the Association for Behavior Analysis International’s 44 Annual Conference later this month. Valdovinos will hold a session titled “The Elephant in the Room: Addressing Psychotropic Medications When Assessing Behavior,” on May 28 in San Diego, Calif. Presenting data collected during research funded by the National Institutes of Health, Valdovinos will discuss the effects of psychotropic medications on adults with intellectual and developmental disabilities who engage in problem behavior. By the end of the hour-long session, participants should know how to collect data on the ways psychotropic medication impacts behavior, and identify the medication’s therapeutic and adverse side effects. ABAI’s website says the session is targeted to board certified behavior analysts, licensed psychologists, and graduate students. Valdovinos has done federally funded research evaluating the pharmacological treatment of challenging behaviors in individuals with developmental disabilities, including autism. 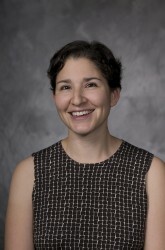 Before joining the Drake faculty in 2010, she worked in residential and day treatment settings with adults diagnosed with intellectual and developmental disabilities. Her courses at Drake deal with She teaches courses in child and adolescent development, psychology of developmental disabilities, behavior analysis of child development, applied behavior analysis, and applied and professional ethics. Valdovinos is a member of the Board of Directors for the Association of Professional Behavior Analysts, nonprofit organization whose mission is to promote and advance the science and practice of applied behavior analysis.